The Italian peninsula is composed of many different environments. Each of them has its own features and peculiarities, that make them the perfect place for specific sports and outdoor activities. This is the case of the Valsesia valley. In fact every last weekend of May white water fans gather in Valsesia valley in northern Piedmont for the annual Valsesia River Festival. Let’s see what the festival is about. Valsesia is comprised by a group of valleys in the very north of Piedmont which stretches from the Monte Rosa massif (its highest peak being Dufourspitze 4,634 m or 15,203 ft) down to the Vercelli plain. The streams of its lateral valleys all flow into Sesia river. Valsesia is an international hot spot for white water sports. Hikers might have heard of the long-distance hiking trail Grande Traversata delle Alpi (GTA), which runs along the Western Alps from the Pennine (Valais) Alps to the Ligurian Alps. Freeriders might know the Alagna ski resort, a hot spot for freeriding in the Alps. 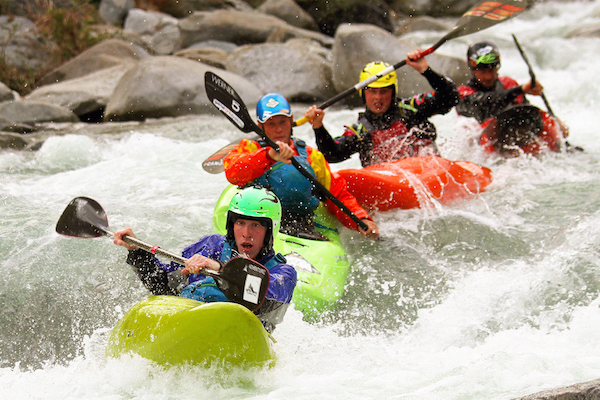 Valsesia River Festival welcomes paddlers of all levels. There are races, guided descents, clinics, films and entertainment. The Festival hosts open races and contests, competitive classes and accessible steep creeking clinics. During this years’ edition participants can enter their own films, which they made during the event. In short: the place to be to enjoy one’s love for paddling and Italian food at the same time. This year’s festival lasts 4 days from Wednesday May 18 to Sunday May 22. Registration open Wednesday, May 18 from 6 pm to 8pm at the Gatto e la Volpe campsite in Campertogno. Coaching clinics are scheduled for Thursday, Friday and Sunday. At clinics experienced, leading paddlers teach the aspiring ones the necessary techniques for steep creeking, running rapids, racing and safety and river rescue. Saturday is the day of the team races and individual races. Interested in trying white water rafting or kayaking in Valsesia? River season lasts from April to September, including rainy days. There are several schools in Valsesia providing everything to try the different river sports such as canoeing, kayaking, rafting, hydro-speeding and canyoning. Essential precondition: you know how to swim. The rest you can learn!